WEATHER: heavy rain overnight cleared by morning but cloud persisted until noon. COLD at first then warm later. A terrific rainstorm blew in overnight, but I slept through it, large puddles and pools of rainwater were everywhere, this boded well for migrant birds dropping in. At the hotel the usual bird-ringing group where there and they gave us a ringing demonstration straight after our breakfast. We saw several species in the hand over about half an hour. As expected the ringers were having a field day, a huge fall of migrants had occurred especially Common Redstarts. We saw plenty of birds at the ringing station including: Common Whitethroat, Willow Warbler, Bonelli’s Warbler, Subalpine Warbler, Common Nightingale, Reed Warbler and about a dozen Common Redstarts. 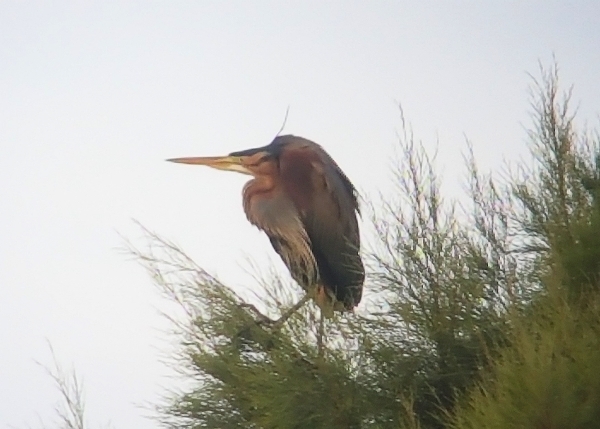 Four Purple Herons were perched in a row of tall tamarisk trees and they took off as we boarded our bus for our day’s birding trip. 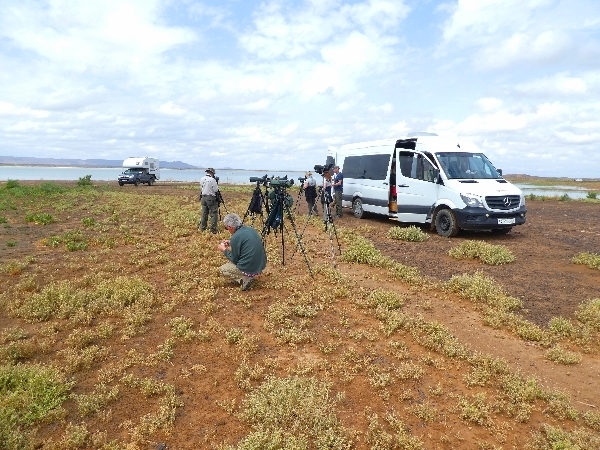 We left the ringers in peace and travelled across the desert towards Merzouga we were heading for a wadi where we hoped to see a Desert Warbler. 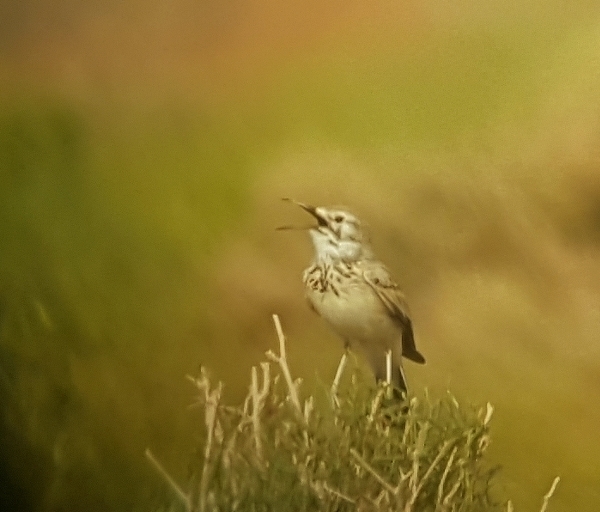 Along the way we bumped into some exciting finds, including Brown-necked Raven, Cream Coloured Courser, Hoopoe Lark and small flocks of Short-toed Larks. 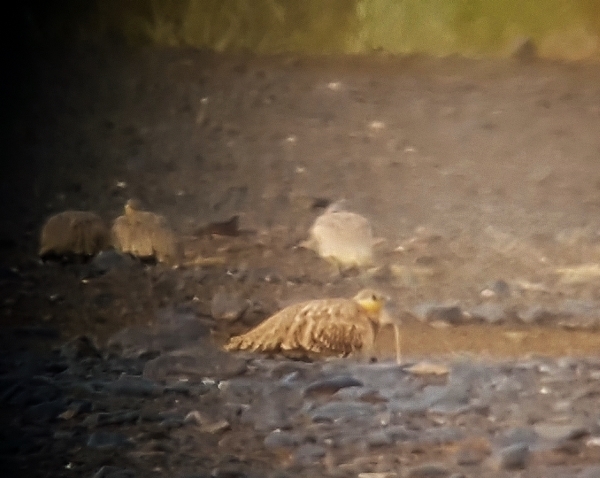 The most interesting find was of a group of Spotted Sandgrouse, they were feeding not far from the track, we counted 33 of them and had great views. At the wadi we spent an hour walking and searching for the Desert Warbler, finding lots of other species but not the warbler. Groups of Spotted Sandgrouse came over, we counted another 30 birds, also seen were Black-eared Wheatears, they are a common migrant on passage, Desert Wheatear, Woodchat Shrike, Short-toed Larks, Desert Wheatear, Subalpine Warbler, Willow Warbler and Brown-necked Raven. The Hoopoe Larks were performing well, showing off with superb flying skills atter giving us a rendition of the British National Anthem! After an hour we jumped back onto the bus and drove a couple of kilometers further on and tried our luck there, this time we struck gold, we saw two Desert Warblers, they seemed to be feeding close to one particular bush and we assumed that they had a nest there, what a fantastic little bird, perfectly adapted to desert life in colour and habits. We had prolonged views of these straw- coloured jewels of the desert. Job done, we drove into Merzouga town where we bought our picnic supplies before driving across to the huge seasonal lake called Dayat Srij. This body of water has not been present for the last 6 years during our visits in March, so it was quite a spectacle to see hundreds of water birds on the edge of the Sahara Desert. How strange was it to see both Camel and Flamingo in the same scope view? There were hundreds of birds out there, we listed about 20 species, the main sightings were of; Greater Flamingo, Ruddy Shelduck, Eurasian Coot, Black-winged Stilt, Ferruginous Duck and Northern Shoveler. Other species worth a mention were; Eurasian Spoonbill, Kentish Plover, Whiskered and Gull-billed Terns and several other birds were seen around or above the lake, Magreb Lark (formerly Long-billed Lark), Yellow Wagtail (both Iberiae and flava), Hoopoe Lark, Booted Eagle, Black Kite, Marsh Harrier and Common Kestrel. A large raft of ducks were too distant for us to get an identification of them, we assumed they were Marbled Duck from their size and shape, (later we found out that 120 Marbled Duck, a dozen Garganey and a couple of Blue-winged Teal were in that flock) so we intend to make a second visit and make an effort to get to the far side of the lake to scope them. We left the lake around 2:30pm and Headed into Rissani where we took the ‘Tourist’ route around the outskirts of the town. We searched for Blue-cheeked Bee-eater and had sightings of two of them but they were fairly high up, calling but not perching. 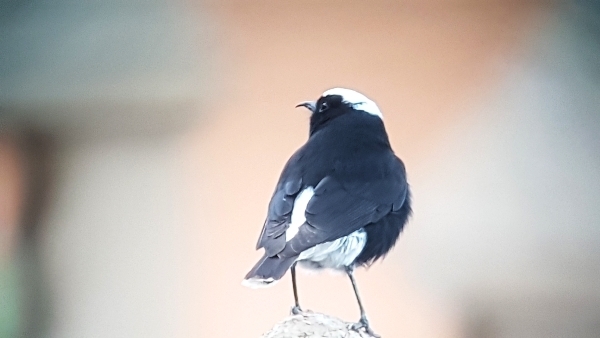 We also saw a lot more Magreb Larks, a few groups of Fulvous Babblers, Common Bulbul, Desert (Great) Grey Shrike (Lanius elegans), Woodchat Shrike, lots of Barn Swallows and several Booted Eagles. We left for the hotel around 5:30 and arrived back around 6:15, some of the group went out for a walk around the grounds, some went for a shower. Those that went for a walk saw two more Blue-cheeked Bee-eaters flying over the grounds and one or two of the group visited the ringing group who showed them a Sedge Warbler and more Common Redstarts. Dinner was served at 7:45, you guessed it, tajine was on the menu!